On September 27, 2007 the Zetas revealed that George W. Bush was a clone, one of 14 zygote multiples created at conception, with only two at present operational. One is acting as president in the White House, the other with the Puppet Master in Europe. On Oct 13, 2007 on the live chat, the Zeta provided more details regarding how a switch to the European clone might occur suddenly. Yet another clone is imprisoned near Denver, broken down by cocaine and booze. President Bush and his look-alikes, the biological identical twins who were raised in secure settings as a back-up, have been assured since birth that they would rule the world during the end times. It is no accident that Herbert Bush headed the CIA in the 1970's, and was selected as Reagan's vice president. The Bush family had plans. The Bush clones, who were in fact identical twins as the zygote was split and implanted into Barbara and several surrogate mothers, show the serious intent, as should the brother in the public eye develop a fatal illness or go insane or refuse to be directed by the cabal planning to rule the world, they could substitute another brother. At present there are only two brothers alive and operational - one in the White House, and the other living with the Puppet Master. The development of the Diebold voting machine, with software holes that allow totals to be manipulated from a remote location, was part of this grand Bush plan. The invasion of Iraq to gain the Middle East oil was another such part of the Bush plan, and is the reason George Herbert Bush left Saddam in place so he would have to be removed at a later date. There were 14 brothers altogether who were born. One of the brothers, who developed a health problem so does not have the physical appearance of the current clone acting as President, records the weekly radio show. There were 3 living clones who could act as President in 2000, but the one acting as the public face during the early years of the presidency was so damaged by cocaine and booze that he was considered out of control, and is secreted away, imprisoned, in case they need a body in which case he would be killed. Another clone was approached by the Puppet Master's agents and agreed to work with him. He is in Europe and could be substituted for the clone acting as the US President at any time. The Bush clone is indistinguishable from the one currently in the White House. Any haircut or tan or scratch can be replicated in the clone residing with the Puppet Master, and this is done steadily so a replacement could occur at any moment if need be. We are in communication with the Puppet Master, and Nancy acts as interpreter on occasion. We, the Service-to-Other Zetas, have teleporting abilities whereby someone can just suddenly appear in a room. We would not be telling you this if the Council of Worlds had not allowed an exception to the Rule of Non-Interference in the affairs of man. If it is deemed better for mankind to have a clone switch, instead of a breakdown in the current clone in the White House with a sudden need to assassinate Cheney, then the switch would be made. The current clone is much more comfortable with press conferences than the clone in place after the 2000 election. By the 2004 election, this first clone was in a type of prison, near Denver. He was the one who had an affair with Ashe. Laura Bush, of course, is much in the know about this, as she must appear with them all. Is there any proof of this? 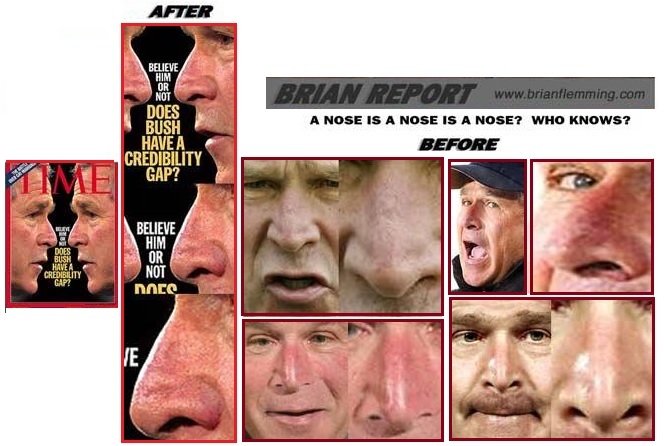 After the 2004 elections there was buzz on the Internet about an apparent nose job, as the President's nose appeared slightly different than before. This rumor even hit the David Letterman talk show. George W. Bush Nose Job? The President Bush pictures above are undoctored. The nose? Not so sure. The political significance of this possible nose job? Zero. A careful analysis of photos during the Bush presidency reveal more than a broken nose, slightly pulling to the left hand side of Bush's face in Clone1, the president from 2000 to the 2004 elections in the Fall of 2003. They reveal that Clone 2, the current president, has an anxious expression. Clone 1 is a party boy, finally becoming unstable due to cocaine and alcohol use, and didn't like giving press conferences. During his reign, there was a period of 17 months without press conferences held by Bush. Clone 2 is comfortable with press conferences, and gives them frequently. The fact that he is a worry wort can be seen in his health problems, as he was striken with the nervous shits, even caught writing Condi a note about having to rush to the bathroom, and appears to be taking tranquilizers. The photo tour can be seen on the Zeta Report 14 video.